In the middle of our semester in London, I went with some classmates to Italy. One of our friends set the itinerary, booking all of our lodgings, and telling us where to be on which days. Travel arrangements, for the most part, was the responsibility of each the individual. So, we round up making our way to Venice in smaller cell groups. We stopped in Bologna only because it’s the birthplace of Kappa Sigma, a frat to which one of our classmates belongs to. Emboldened by the spirit of his fraternity’s forefathers, this guy overcame his fear of heights and climbed with the rest of us to the top of the Golden Assay, a tower overlooking the city. Before the tower, we went to a restaurant called Da Cesari for lunch and walked around chugging a giant bottle of wine. Da Cesari supposedly has awesome rabbit ravioli, but I made the mistake of ordering some pasta with Bolognese sauce which was rather mediocre. Rushing out of Bologna, we got to Florence around sunset. When we were shown to our hostel rooms, I was thoroughly grossed out by my gassy male roommates, particularly since the space was so small. Unable to find lodging elsewhere, I stayed in the other room with my other classmates (yep, I’m that high maintenance). We had dinner at Da il Latini—easily the best meal of the trip. Once seated, we were given an unlimited amount of food of whatever the kitchen was preparing that day, and unlimited wine. The meal included three or four types of meats, two pastas, and some other stuff. My personal favorite was the chicken liver spread over a slice of toasted baguette-like bread. We asked for an extra plate of those. The meal was capped off with some limoncello (lemon liqueur). Cinque Terre is a collection of five villages built on rugged cliffs on the western coast. The car I was in got there earlier and we checked into the “hostel” first. This place was awesome, ’cause we booked the entire two-bedroom apartment (which had two bathrooms and a little kitchen) for our group. It was luxurious compared to the compact hostels we’d been staying at prior. Since the group in the other car hadn’t arrived yet, we gave them a call. They told us they’d gotten lost and were still on the way. So, we waited for what might have been a full hour or so before we went out to explore without them. We looked at stuff, ate some gelato, saw a wet dog, and then got a table for dinner. It wasn’t until we’d already ordered when the guys from the other group showed up. I don’t recall who spilled the beans, but some of the guys or the one woman in the other group revealed to us that they hadn’t actually gotten lost. They’d simply stopped at the beach for a while, and for some reason whoever was on the phone decided to lie about it. Our little leader, the one who planned most of our itinerary, was peeved at the lie. I don’t think her boyfriend or the two other women from our car really minded. We were exhausted from the fast-paced travel and welcomed the downtime. I think, in particular, the women were appreciative of the ability to take a hot shower (having skipped their showers in the morning thanks to the broken water heaters in Florence). The next day, my group took the train to Manarola, one of the other Cinque Terre villages. A little bus brought us up into the hills to the Cantina Sociale for wine tasting. It was raining and, from the looks of it, the place was closed. After a bit of knocking, someone finally showed up to let us in. After sampling some pretty good wine and making some purchases, we walked (a long way) back into town. Her Majesty was not happy with our lack of transportation. We arrived late in the night and I felt rather at home, having spent however many days there in my previous trip to Italy. I knew exactly where our hostel was ’cause I’d been there before: it was the Yellow Hostel where I’d gotten blackout drunk a year before and missed the New Years’ countdown. So, more or less, I led the group to the hostel. As with our prior accommodations, the size of our group allowed us to book another two-bedroom, two-bath setup for just us. Following Rome, our group split up into three or four smaller groups as originally planned in London. I made the journey to Pompeii in a little group of three. We took the train to Naples and, once again, I was unimpressed with the city. Admittedly, we didn’t stay there long enough to get much of a feel for it. After my last experience of being barred entry into Pompeii at 3:15 PM, I had us catch the earliest possible train to get to there. When I finally entered the ruins of the ancient city, I understood why the cutoff time was 3 o’clock. The place was huge. We wandered for hours and still didn’t see everything before we were simply too tired to walk. On our way out, we stopped by the Villa Dei Misteri. Despite the intriguing name, my friend and I quickly grew bored of the building. We went outside and sat on the curb, waiting for our other friend who was a bit annoyed with us ’cause she thought we ditched her. Good times. After Pompeii, I went off on my own, returning to Rome for a night before flying to Germany (which I’ll get into in another post). 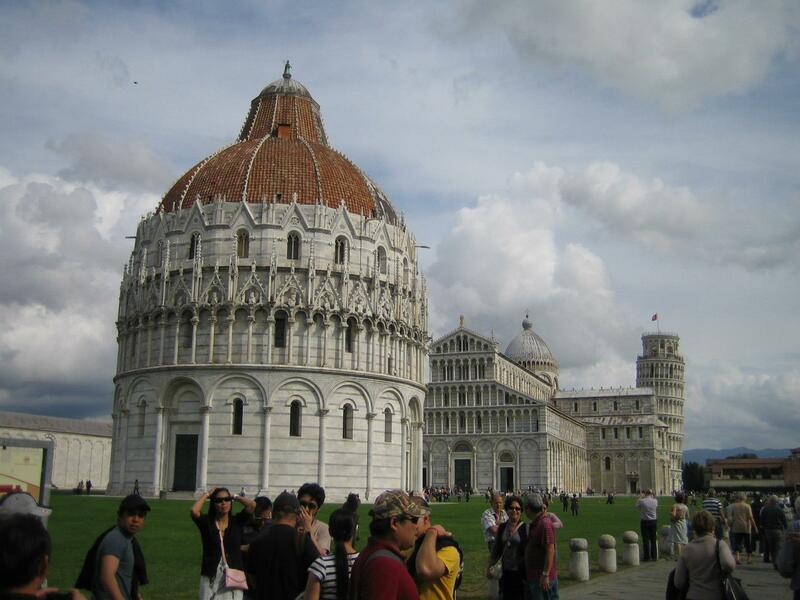 This entry was posted in Other Stuff, Writing and tagged Bologna, Cinque Terre, Florence, Italy, Leaning Tower of Pisa, Pompeii, Rome, Study Abroad, Transportation Strikes, Travel, Travelogue, Venice. Bookmark the permalink. ← 10 Tips for Better Writing! Le Sigh. So many places to travel and no money to do it! 😦 If you’re ever in my neck of Ontario, Canada I could probably do it justice, lol. Glad you had a good time at any rate. That’s quite a big disclaimer + signature you’re using for your comments. Haha. Not sure when I’ll go to Canada next. I’ve been there only once when I was a little kid. Oops, sorry. I sometimes forget to delete that when I reply from my email :(. Great pictures! I went to Rome/Naples/Pompeii as part of a High School trip. I would love to go back there someday. Yeah, I think I’ve had my fill of Italy for a while (went there one more time after the trip described in this post). Good heavens you have seen more of Italy than I have and I have lived here for the past 7 years!!!! That’s fun. I did something similar in Japan (going somewhere and ending up without a place to sleep). Thank you for possibility of visiting those all ancient places through your photos. Fantastic photos. I have never been there but I could see them thanks your photos. Did you happen to attend any of Berlusconi’s bunga bunga parties. Now that’s a bit of Italian culture I wouldn’t mind partaking in. Cinque Terre is pretty nice. Never heard of it ’til my friend started planning our itinerary. Beautiful. I visited Italy years ago, my son-in-law and family stationed in Navy there. The people are so wonderful and loving. I would love to go back. Thanks for the awesome pictures! Fun and informative post – pictures and words tell an interesting tale !! How lucky to see all these places in Italy. I love all the pictures, especially that of the Leaning Tower of Pisa! Your photos are awesome, it makes me want to go there now!